What to wear for a video or television interview? What to wear when appearing on TV? Well, according to professional stylists, what you wear is key to getting across your message to your audience. So… let’s get to it! 1 – Invest in a new outfit. Invest in a couple of good video outfits. What do you mean by invest, we hear you say! Here’s the truth – no outfit looks quite as good as a new outfit (or one nearly new). So, keep a few outfits going in your closet – ones specially reserved for those TV or video appearances. This means that not only are you always ready for an impromptu televisual opportunity, but that you always have something new or near new close to hand, that you’ve selected at your leisure. Ensure a flattering fit, of course – new clothes don’t make up for bad tailoring! If your budget won’t stretch to clothing, then just wear the newest clothes you have and project confidence. Remember: if you feel smart, you look smart! 2 – Don’t forget the shoes. Wear new Shoes, not street shoes Although tight shots are most common for video interviews, you never know what might creep into frame. Like with your ‘video outfit’, keep some fresh, clean, new ‘interview’ shoes in a shoe bag, ready for any potential shoot. Whatever you do, don’t wear them outdoors! Not only will they scuff – but also the underside of your shoe may show up in a video (not a pretty sight!). Ladies – if you can, wear some closed toe shoes, or at best, anything with a solid heel. Gentlemen – just make sure your shoes are polished, clean and smart! Oh, and wear some decent socks. There’s nothing more off-putting then unsightly ankle flesh! 3- Baggy is a No ! Don’t go baggy. Whatever you do, make sure that your clothes fit well. Baggy clothes will flatten out on camera, making you seem shapeless and heavy. If there’s a choice between too snug and too loose, go snug! 4 – Go all seasons. A video is for life, not just for Christmas. Don’t forget that once your video or TV appearance will be placed online, and live for a long while after your initial appearance on film. So, wear something that’ll look good in any season – something a little conservative, but light. Don’t dig out those Hawaiian shirts – viewers in December might think it extremely odd! 5 – Keep it simple. As said above, go for something classic, something simple. Not your style? Well, if you prefer something a little more casual or high-end, try and refrain from fussy patterns or complex weaves. Men, your best bet is the elegant (yet timeless) suit/jacket combo. If you’re looking to be a little more casual, a polo top would also suffice. Ladies, try trousers. They tend to look much better than skirts or dresses, especially if you are seated. Prefer something more casual? Dark jeans are fine – try to match them with smart shoes, if you can – preferably heels of some sort. Naturally shorts are not advisable – remember, Summer only lasts a season! If you must wear a skirt, ensure the hemline is well below the knee. As for tights… well, it’s a risk! Our advice? Flesh coloured fishnets, or, if you can pull them off, bare legs or knee high boots. 6 – Don’t forget the microphone. 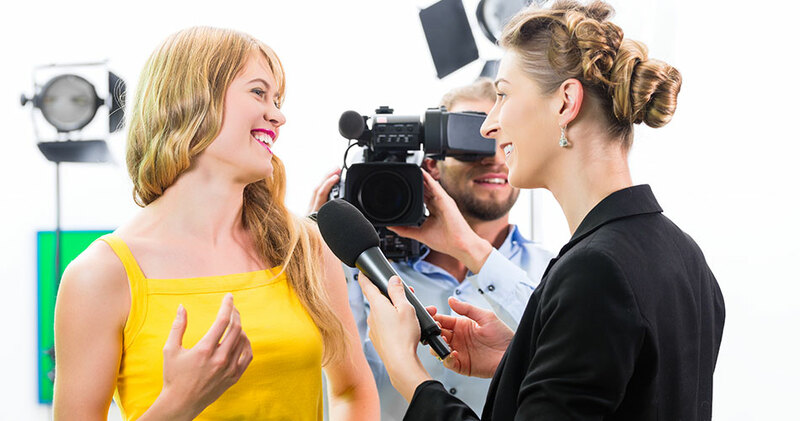 Remember, you’ll be wearing a microphone If you’re being interviewed (which you probably are!) there’s a decent chance that you’ll be wearing a lapel clip mic. Wear a shirt with a collar or lapel. If you must wear something a little less microphone friendly, try and wear a jacket with lapels – the sound operator will thank you for it! 7 – Keep the accessories simple. Accessories have a horrible tendency to produce unwanted noise. Whether that’s jangling or rustling, necklaces and dangling earrings are a nightmare for microphones. Keeping accessories to a minimum reduces the chance of unwanted background noise, meaning that the audience is not distracted from your message. It’s advisable to keep rings to a minimum (one per hand) and to avoid watches, crystals, diamonds or anything reflective. The last thing you want is to be reflecting light right back into the camera – not only will it give the cameraman a headache, but it’ll distract your viewers for your message or service. Avoid wearing certain clothes contrast is the sworn enemy of camera focus. Therefore, if you are dark skinned, don’t wear a light top –and vice versa. Also, pay attention to your set – if you’re wearing dark against a light background, it may be a challenge for the camera to focus on you. If you can, try and opt for low contrast clothing, in medium shades. Obviously, black suits and white shirts are both inadvisable, due to the starkness of the contrast. Don’t forget these rules apply to any props you may be thinking of bringing onto set! 9 – Wear TV friendly colors. Recommended TV friendly colours: Pastels Blues (of all shades) Purples Greys Wine/claret Navy. 10 – Patterns to avoid. No matter how prepared you are, you should always be doubly prepared. Even if it’s just a different top, or an alternate jacket, it’s a good idea to bring a change of clothing. What if you arrive, and you’ve got the same jacket as another interviewee? Or the same shoes as your co-host? Whatever the situation, it’s best to be prepared. Video shoots are often high-pressure environments – make things easy for yourself!